Bamboo is considered as an alternative to timber. This is one reason why science and technology is applied to further enhance its growth performance and ensure its sustainability. This is being done by the Philippine Council for Agriculture, Aquatic, and Natural Resources Research and Development of the Department of Science and Technology (DOST-PCAARRD), particularly its Forestry and Environment Research Division (FERD), which has identified bamboo as one of its priority commodities. DOST-PCAARRD partnered with the Department of Environment and Natural Resources (DENR) and state universities and colleges to develop technologies that could enhance the propagation and plantation management of bamboos. Among these technologies is the propagation via branch cutting from three to four-year-old bamboo culms and one-node culm cuttings. Another technology is the clump management and suitable cultural treatments for the species of giant bamboo (Dendrocalamus asper Schultes f.) and kawayan tinik (Bambusa blumeana J.A & A.H. Schultes f.). It was also found that branch cuttings from three to four-year-old culms are the best planting materials for giant bamboo propagation. At least 10 branches can be collected from one giant bamboo culm and each branch should have two to three live nodes and live buds. These branch cuttings will develop sprouts seven to 10 days after potting. With proper care and maintenance, the potted branch cuttings will be ready for outplanting after at least three to four months. As for the kawayan tinik species, one-node culm cuttings is the propagation method suggested for its propagation. The mother culm selected is segmented into one-node culm cuttings. One-node cuttings are cut out from the mother culms containing an equal portion of the lower and upper internodes of about four to six centimeters. After a month, the rooted cuttings that developed sprouts are exposed to sunlight to improve growth. Then, in six to 12 months, the potted cuttings are ready for outplanting. In order to sustain shoot or culm yield, clump management for both species should be done through regular tending operations such as cleaning, thinning, mounding, mulching, and fertilization. Rehabilitation of existing old bamboo clumps can be achieved through the application of suitable cultural treatments which includes sanitation cutting, cleaning, or fertilizer application. This method offers a quick and cheap means of increasing the supply of bamboo. 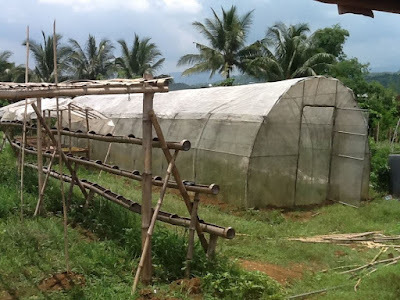 These methods are now widely adopted by farmers and nursery owners growing and selling bamboos for livelihood in regions 3, 4-A, 6, and 10 and beginning to be replicated by other individuals throughout the country.